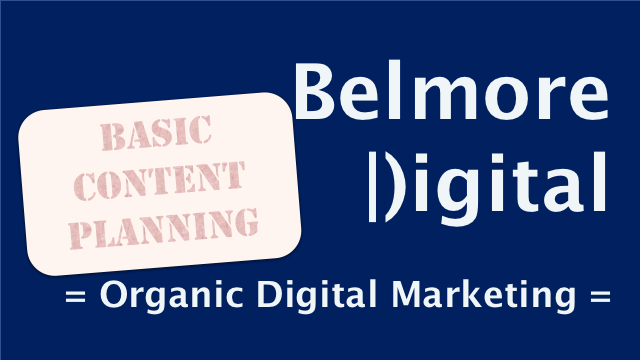 Basic content planning is an important step in delivering your SEO web project to desired goals and objectives. Ranging from understanding the prospective user, understanding where they may be on their own user journey, and just plain writing down the keywords and topics you need to talk about and how to structure it as an information architecture: it’s all important. Nothing happens without a plan – especially content. Content planning gives you a strong chance to think about your users and how you want to engage with them. The essence of any good plan is, of course, flexibility. If you get the structure of your content and targeting right, creating the content is an awful lot easier. Once you have completed basic keyword research and basic competitor analysis, you should be in a very good position to start content planning. If you haven’t done those things, go back and do them. The keyword research will give you the topics to cover, questions to answer and insights into who the users are. Keyword research will also help you to prioritise the topics to cover by analysis of search volume, place in the users journey, synonyms. Competitor analysis will give you a great insight into what types of content your competitors use successfully. Create a plan which lists out the topics you need to cover. Ensure you analyse whether the content needs to be evergreen, seasonal, or constantly updated. This will affect when you publish and if you update the content. Ensure you identify the type of user who is likely to want to read the content. Give them a name / personality if you like. Within the plan, identify what type of content will appeal to the user for a particular topic – eg lists, videos, checklists, guides etc. Start broad for each topic and refine as you plan the actual creation of the content piece. Decide on a Publishing Schedule – you may decide to release as you go, or you may decide to complete everything in a big bang. Both methods work. Now it’s planned, start creating the content. Create the content in line with Basic Body Content Guidelines.